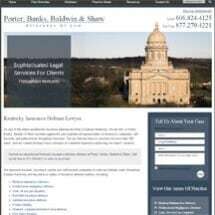 For more than 100 years, the attorneys at Porter, Banks, Baldwin & Shaw, PLLC have represented insurance companies, self-insured and professionals in insurance defense cases involving medical malpractice, professional negligence, environmental claims, product liability, civil rights claims, employment claims, education claims and more. Located in Paintsville and Lexington, our offices serve clients throughout Eastern Kentucky. Our attorneys bring decades of combined experience and unique legal backgrounds. With such a wide range of skills, we are able to offer our clients an array of versatile legal services and solutions. Our attorneys are dedicated to providing clients with customized, high-quality legal services from start to finish. If needed, the firm's attorneys have access to an array of expert witnesses to assist in your insurance defense case, including medical professionals, engineers, accident reconstructionists and more. These experts can provide testimony and information for your case. The law firm of Porter, Banks, Baldwin & Shaw, PLLC is large enough to offer the resources of larger firms, but also small enough to offer cost-effective legal services delivered with a personal touch. We handle each case with a consciousness of our clients' budgets, working to provide effective, yet affordable, legal solutions. You can count on our hometown law firm for skilled and aggressive insurance defense representation throughout Kentucky. Call us at 606-789-3747 or 877-270-4221 to schedule a free initial consultation. Abarta Oil & Gas Co.